You'll find lots of Christmas quilt patterns on the Quilting Website, and many more patterns that can easily be converted into Christmas quilts by altering their fabrics. Star quilts make wonderful quilts for the holidays, and if you're careful with color selections they fit-in perfectly during the rest of the year, too. Speed piecing techniques make stitching this little star quilt a breeze. The light fabric that surrounds the star blocks blends with the angel fabric used in the center of the snowball quilt blocks, giving the snowballs an on-point appearance even though all blocks are sewn together in horizontal rows. The Snowballs offer an open space to feature any holiday-related novelty fabric. The quilt measures 29-1/2" square. Grab an iron, fabric squares, Styrofoam balls, straight pins and scraps of fabric. That's about all you'll need to make these easy handcrafted Christmas ornaments. Once folding is complete, the remaining steps can be completed while you watch television or listen to music, and the projects are small and portable enough to carry with you on trips. Winged Squares are perfect for this table runner, and it's made by placing two of the blocks side by side. My blocks are surrounded by a border print fabric, but any fabric of your choice will work perfectly. The pattern was originally written as a mystery quilt, but you can flip through to read all pages. Fabric postcards can be as simple or complex as you like. Cards can be sewn using any technique, including patchwork and applique, and can be embellished with yarns, threads, small buttons and other kinds of trim. My fabric postcard instructions walk you through the mechanics of the process so that you'll end up with a handcrafted card that you can pop in the mail to family and friends. Several techniques are included. The Holiday Harvest quilt is made from two quilt blocks, a 10" patchwork Grape Basket combined with an applique Oak Leaf and Acorn quilt block of the same size. All quilt blocks are placed on point and surrounded by setting squares. 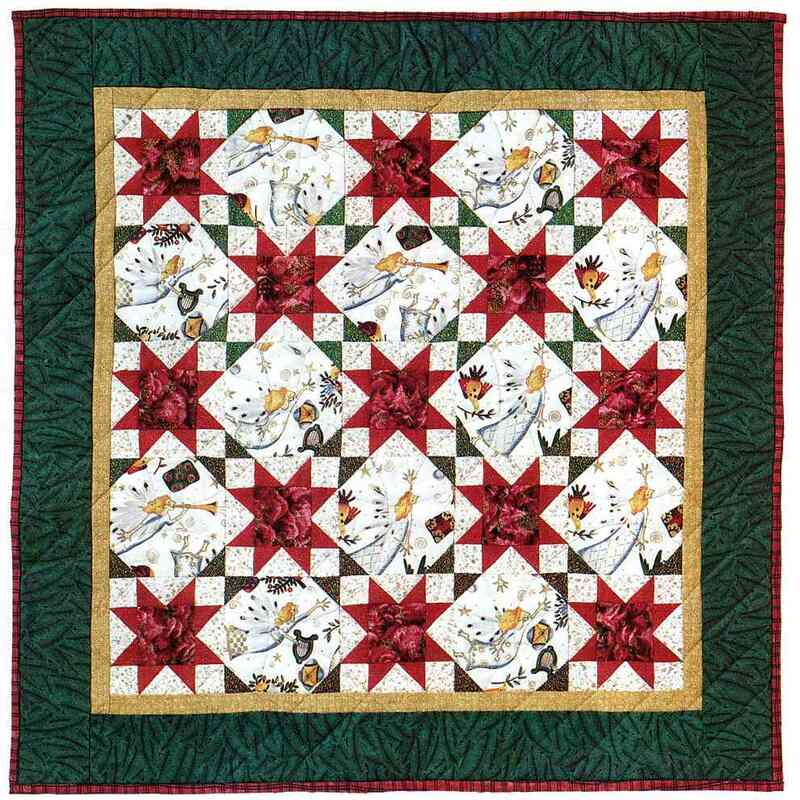 Christmas Orchard is an example of how easy it is to convert any quilt into a Christmas quilt pattern. It's made from two traditional blocks, Snowball and Practical Orchard, and is super easy to assemble. You can shift color and contrast around to make different components pop out in the quilt. Here's a design that was inspired by Carol G's tree quilt in our online photo galleries. Stitch the tree in one of two ways, as a rag quilt or as a typical smaller quilt. The rag quilt doesn't have huge units -- they finish at 4" square. The mini's are smaller, of course, with each square in the quilt finishing at 2-1/2". You'll find a couple of layout and assembly options within the quilt pattern. This Christmas table runner is made from four patchwork blocks placed on point and surrounded by rosy red setting triangles. A narrow inner border repeats the plaid fabric used in the strip pieced units of blocks, and a wider outer border is made from the same fabric used at block centers. Change the fabrics to make the table runner pattern suit any season or theme. Fold fat quarters of quilting fabric into little triangles and stack them into star-like bundles. Any quilter would love to find one of these stars on her Christmas present. Here's a 10-inch square Christmas Tree quilt block that you can use for a holiday sampler or to create an entire forest of trees in any theme. Dress the tree up with a bit of hand or machine applique if you like. Just cut out small holiday prints and appliqué or fuse them in place. How about little stockings on the tree branches, and teddy bears and presents near its base? You'll find more than one ​bug jar quilt pattern on the Quilting Web site. And forget the bugs, because the short, squatty jars illustrated here are perfect for filling with holiday cookies and candy. The pattern includes instructions for 12" quilt blocks.